AMLO is going to win the Mexican election, unless elites take him out first. Mexico has never had democratic elections, not in a hundred years. He was right. The 1920 elections ended in murder. President Venustiano Carranza, who supported Ignacio Bonillas, had his followers beat and murder backers of Álvaro Obregón. Obregón in turn organized a coup and his supporters assassinated Carranza. Today, Andrés Manuel López Obrador (AMLO), the left candidate in the Mexican election, leads in the polls by as much as 22 percent over his nearest competitors, Ricardo Anaya of the conservative National Action Party (PAN) and Jose Antonio Meade, candidate of the ruling Institutional Revolutionary Party (PRI). With the election scheduled to take place in a little less than two months, on July 1, AMLO seems destined for victory. 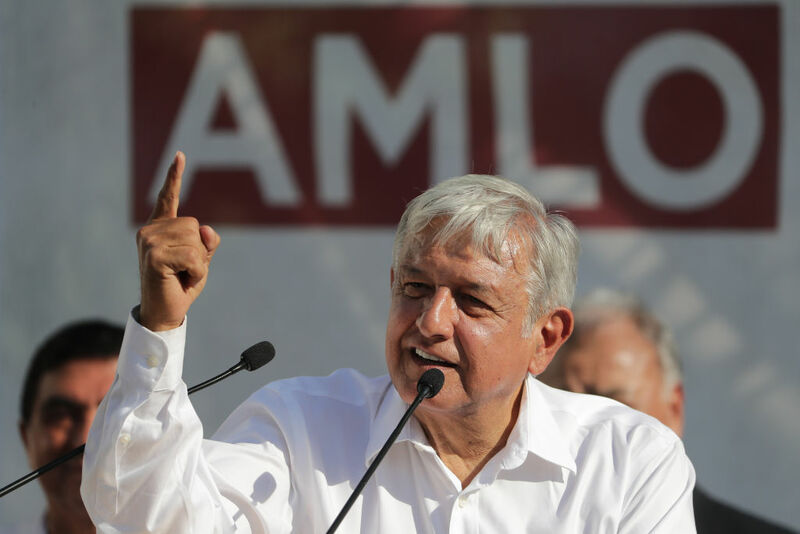 Though he has been speaking in a more moderate tone lately, the American and Mexican elites are horrified at the thought that López Obrador, who might be characterized as a left populist or a social democrat, would jeopardize their profits. As AMLO’s lead has grown, the value of the peso has fallen, because of a growing fear that investors will desert the country. In addition to threatening refinery profits in the United States, his proposals could slow oil production in Texas and impede deepwater drilling in the Gulf of Mexico by international oil giants like Exxon Mobil and Chevron. They would also jeopardize the United States’ energy trade surplus with Mexico, which reached roughly $15 billion last year. Morena’s “declaration of principles,” posted on its website, asserts that the liberalization of the economy is part of a ‘regime of oppression, corruption and privileges.’ And that it is the work of “a true Mafioso state built by a minority of concentrated political and economic power in Mexico.” If that’s what Mr. López Obrador believes, fixing it would seem to require more of a socialist revolution than he proposes. She writes that, “Over the years he has earned a reputation as a populist demagogue who uses the streets when democratic institutions block his path to power.” And she warns her readers against his “socialist party,” Morena. Champions of civil society, transparency, and strong independent public institutions can derive little comfort from some of [AMLO’s] recent pronouncements. On the stump, he offers a return to a time of business subsidies, state ownership, and agricultural self-sufficiency. He repeatedly questions energy and infrastructure contracts—including those undergirding Mexico City’s new $13 billion airport—and promises to roll back the educational shifts underway. The reports in the business press and the warning from the Council on Foreign Relations are intended to convince the American business class and the State Department that something must be done to stop López Obrador. We have to place the current elections in the economic and social context. Mexico today is in a profound political crisis. Since the election of Donald Trump, Mexican-US relations have reached a low point. Trump threatens to destroy NAFTA and it’s not clear what he would put in its place. So the economic predictability, the be all and end all of capitalist politics, is in question. Mexican immigration to the United States — historically seen as a safety valve in a country where about half the population lives in poverty — has declined to the lowest level in years. The unemployed and the underemployed are forced to stay home and can’t live on Mexican wages. With a population of 127 million, some 55 million live in poverty. The 104,583 homicide cases registered since [President Enrique Peña Nieto] took office in December 2012 are more than the 102,859 officially recorded under his predecessor, Felipe Calderon, who deployed military personnel around the country to confront organized-crime and drug-related violence. Mexico’s police, for their part, routinely torture and murder. At the same time, time, government repression and manipulation mean that the labor and social movements are weak. While there is periodic unrest, there are no powerful workers’ organization and no strong independent social institutions. Those dissatisfied with the government have only López Obrador, a charismatic leader, and his populist Morena party. It is this that makes his likely election all the more worrisome to the US and Mexican elite. Some historians would argue that soon after the Mexican Revolution of 1910, Francisco Madero won the only democratic election in the country’s history. Madero, however, failed to satisfy Mexico’s foreign investors, and US ambassador Henry Lane Wilson, working with European ambassadors, organized his overthrow and assassination. Then there was another decade of violent revolution. After Obregón founded the modern Mexican state, back in 1920, his successor Plutarco Elías Calles, established the ruling elite’s political party, which eventually became the Institutional Revolutionary Party (PRI) that ruled Mexico from 1929 to 2000. For decades the PRI won all the elections for every office, from president to mayor of the smallest town. This was done through fear and favors, clientelism and patronage, fraud and, when necessary, murder. There were always challengers. Vasconcelos was one. Obregón, chose José Vasconcelos, a left-winger once associated with Francisco “Pancho” Villa and Emiliano Zapata, to head the National Autonomous University of Mexico (UNAM) and then to be secretary of education. In a fraudulent election accompanied by violence, Vasconcelos lost to Calles’s candidate, Pascual Ortiz Rubio. He attributed that defeat to Dwight Morrow, former J.P. Morgan banker and ambassador to Mexico. Fearing for his life, Vasconcelos fled Mexico, and disillusioned with democracy, he eventually became a fascist. Again in 1951, there was a real opposition candidate in former military officer Miguel Henriquez Guzmán. He broke from the PRI and created a new broad party, the Federation of Mexican People’s Parties, running on a platform of populism and democracy. There was the usual PRI campaign: beer and tacos for the masses, party officials bringing their constituents to the polls and helping them to vote, intimidation and violence of those who supported the opposition. The PRI’s Adolfo Ruiz Cortines, won, of course. There were protests in several states by Henriquez Guzman’s supporters, but they were brutally suppressed. In the 1980s, Mexico’s economic model, based on nationalizing some key industries, protective tariffs, the creation of a national market, and a significant social-welfare system, had gone into crisis. The country went bankrupt. US banks forced Mexico to change, and a section of the PRI, educated at the Harvard Business School, was only too happy to do so. The PRI split between the so called “dinosaurs” of the old nationalist school, led by Cuauhtémoc Cárdenas, and the “technocrats” of the new neoliberal group led by Carlos Salinas. Cárdenas and his followers in the Democratic Current left the PRI. In 1988, Cuauhtémoc Cárdenas, the son of Mexico’s most beloved president Lázaro Cárdenas, ran for president at the head of a broad left coalition. He was tremendously popular in many parts of the country with enormous crowds coming out to cheer him in many areas. On Election Day, July 6, 1988 he was leading in the vote count when suddenly the computer stopped tallying the vote. The ruling Institutional Revolutionary Party (PRI) told the Mexican people that “se cayó el systema,” that is, “the system crashed.” The counting continued in some other fashion and in the end the government announced that Cárdenas had lost and the PRI’s Carlos Salinas de Gortari had won. Once in the 1990s, at a dinner with Cárdenas and other left political leaders, I asked the former candidate why he hadn’t fought to take the office he had won. He told me, as he had told others, that he didn’t want to see a bloodbath. Having shied away from revolution then, he left the country to degenerate into the bloodbath it has endured for the last thirty years. After losing the 1988 election, Cárdenas and his followers, joined by small left political parties, formed the Party of the Democratic Revolution (PRD), which went on to become a significant force. Before the PRD could once again challenge at the presidential level, in 1994 a PRI candidate, Luis Donaldo Colosio, ran for the office. Colosio, with a long political history in the party, had been a protege of Carlos Salinas. He had run Salinas’s 1988 presidential campaign, the election stolen from Cárdenas. And he had been elected senator from the state of Sonora. Salinas had selected Colosio for the cabinet post of Secretary of Social Development, head of the country’s poverty programs. Then Salinas chose him to be the PRI’s candidate for president. But on January 1, 1994, an obscure revolutionary named Comandante Marcos had led an uprising of indigenous people organized in something called the Zapatista Army of National Liberation (EZLN) in the southernmost state of Chiapas. Suddenly questions of democracy, economic inequality, and racism came to fore. And at the same time another PRI leader, Manuel Camacho Solís, who was leading negotiations with the EZLN, broke with party custom and also campaigned for the presidency. Colosio, whose campaign was slow to get off the ground, decided to take up issues that had been raised by the Zapatistas in a March 1994 speech he delivered on the sixty-fifth anniversary of the PRI’s founding. Speaking passionately, Colosio called for greater transparency and democracy, for aid to poor farmers and for respect for the indigenous communities, for aid to workers facing unemployment and low wages, for opportunities for the young, for a greater role for women, and criticized government abuses of power. The speech gave Colosio sudden popularity with Mexico’s underdogs. His speech represented a break with President Carlos Salinas’s neoliberal politics and a return to nationalist, social-welfare policy. PRI leaders and the PRI-controlled labor unions shouted out “Colosio Traitor!” and “Death to Colosio!” at his rallies. Two weeks later, on March 23, 1994, a man later identified as Mario Aburto Martínez, a twenty-three-year-old factory worker, rushed up to Colosio, who was campaigning in Tijuana, and shot him in the head, killing him. Public opinion in Mexico attributed the murder to Salinas, believing that he had had Colosio killed. Though Aburto Martínez supposedly confessed to police, many Mexicans believed that he was not the actual killer but simply someone substituted for the murderer. It turned out that the head of Colosio’s team of bodyguards, Fernando de la Sota, had worked for both Mexican security services and been a CIA agent. The Mexican Attorney General thought that that was irrelevant. With Colosio out of the way, Salinas chose his education minister, Ernesto Zedillo, to stand as the PRI’s candidate, and, of course, he won. A few months later Salinas’s brother-in-law and major PRI figure José Francisco Ruiz Massieu was also murdered. While like most murders in Mexico it remains unsolved, many believe that Raúl Salinas, brother of the president, was the mastermind behind it. It was around this time that AMLO became the most visible challenge to the Mexican system. In 1989, though then head of the PRI in the state of Tabasco, he joined the PRD, ran for governor, and won. López Obrador became the party’s rising star and leader from 1996–99. In 2000 he was elected the mayor of Mexico City and achieved widespread popularity with his social liberal approach, working on development with financiers and developers and extending social programs to the needy, most famously his pensions for senior citizens. At the same time Vicente Fox, a Coca-Cola executive and candidate of the pro-business National Action Party (PAN), ran for the presidency. The PRI stranglehold was over, but the powers that be had made it clear in 1988 that they would never let the Left come to power. For many Mexicans, Fox was the only realistic vote for change on offer. Mexico had a new president, but the political and social system stayed in place. But despite the resistance, in the end Felipe Calderón of the PAN became president and launched his disastrous war on the drug cartels. AMLO’s 2012 campaign gained less traction, but now he is once again in a position to win an election — summoning renewed fears of sabotage and worse. If They Kill Him, What Then? As the Colosio assassination demonstrates, the Mexican elite can and will kill problem candidates. Why might they assassinate López Obrador? Another fraudulent election, like 1988 and 2006, at this time of particularly deep political crisis, could lead to large-scale popular protests and such movements can get out of control. And this time, unlike 1988 or 2006, López Obrador appears to have the will and the social base to provide leadership to a popular upheaval. Mexico could become so unruly that the United States government and the Mexican elite might have to intervene to oversee a kind of transition to a López Obrador presidency yoked to the ruling class. This might still lead to the sorts of reforms that would threaten profits. But the assassination of López Obrador removes him from the scene, and since he is a populist whose charisma holds his movement together, once he is gone, there is no alternative leadership. Second, the assassination of the candidate so close to the election could provide the excuse for a kind of emergency government of national unity — PRI, PAN, PRD, and even Morena — overseeing a period of martial law. With the country already largely militarized, and with the existence of military commanders in parallel with every governor in the country, establishing such a state of siege would not require much effort. Mexican leftist presidential candidate Andrés Manuel López Obrador, the front-runner ahead of July elections, would respect a renegotiated North American Free Trade Agreement if the U.S., Mexico and Canada reach a deal before the vote, according to a top aide. If a deal is sealed, a López Obrador administration wouldn’t reopen the talks to renegotiate chapters already agreed on or seek to include new items, said Graciela Márquez, a Harvard-educated economist who has been named by Mr. López Obrador to become his economy minister if he wins the election. That would put Ms. Márquez in charge of trade and industry policies. If he is unwilling to continue to move to the right AMLO risks his life, and he risks his movement. Or then again, he could attempt to act preemptively, to take the offensive, to call for the uprising that Cárdenas and he both shied away from in the past. I would be delighted if my speculations proved wrong and if AMLO could defend a social-democratic program and avoid being pulled into the arms of the US State Department and the Mexican clase política. But as they have for over a hundred years, the prospects for democracy in Mexico look dim. Dan La Botz is a member of the New York chapter of the Democratic Socialists of America.